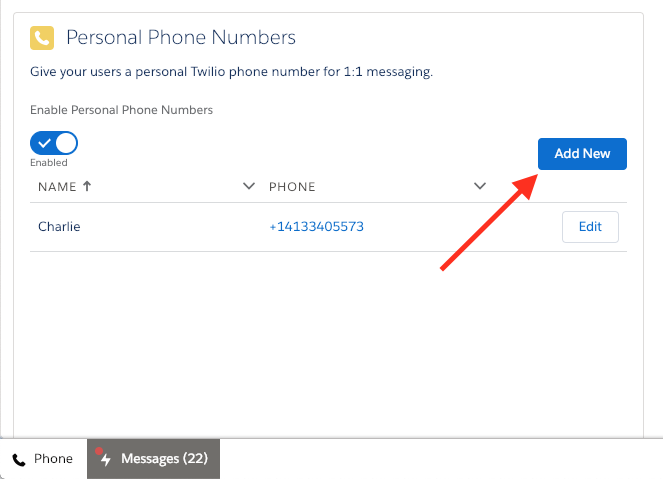 The personal phone numbers feature is only available in version 4.4 of the Twilio for Salesforce package and later. The personal phone number feature allows a Salesforce administrator to assign a phone number to an individual Salesforce user. Without personal phone numbers, Twilio for Salesforce uses Copilot to choose the best number in your number pool. Once enabled, personal phone numbers ensures that outbound messages from a Salesforce user are always sent from the same phone number. This is useful if you need to establish a 1:1 relationship between users and phone numbers, such as if the Salesforce user sending the message distributes business cards with a contact phone number. Users who aren't assigned a personal phone number will continue using the number pool. The number pool will be used for all 1:many messages sent from campaigns and process builder. This is due to the fact that if a single long code number were used for large message sends, it could result in carrier filtering. When you enable the personal phone number feature, Salesforce will begin importing messages from all phone numbers in your Twilio Project. If you have some phone numbers with a high amount of traffic that are not used by Salesforce, these messages will be imported into Salesforce. Consider creating a separate Twilio Project for Twilio for Salesforce if you anticipate this issue. Step 1: Go to the "Twilio Configuration" page and click "Enable Personal Phone Numbers". Step 2: Make sure you understand the warning about pulling all messages from your Twilio project and then click continue. 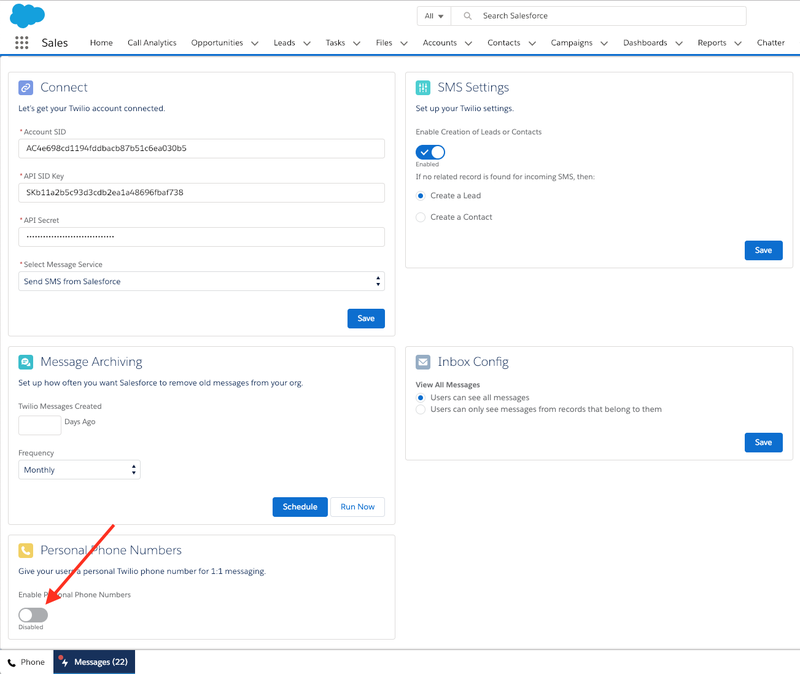 Step 3: Click on "Add New"
Step 4: Select a Salesforce user from the dropdown, select the corresponding phone number, then click "Save". Note: Users will not appear in the dropdon menu unless they have been added to the "Twilio User" permission set.